With the railway cover almost the whole country, train is the best way to immerse yourself in the stunning setting of the majestic landscape in Vietnam. The best part is that you won't to worry about being cut off by a reckless truck driver flying to his destination at breakneck speed. 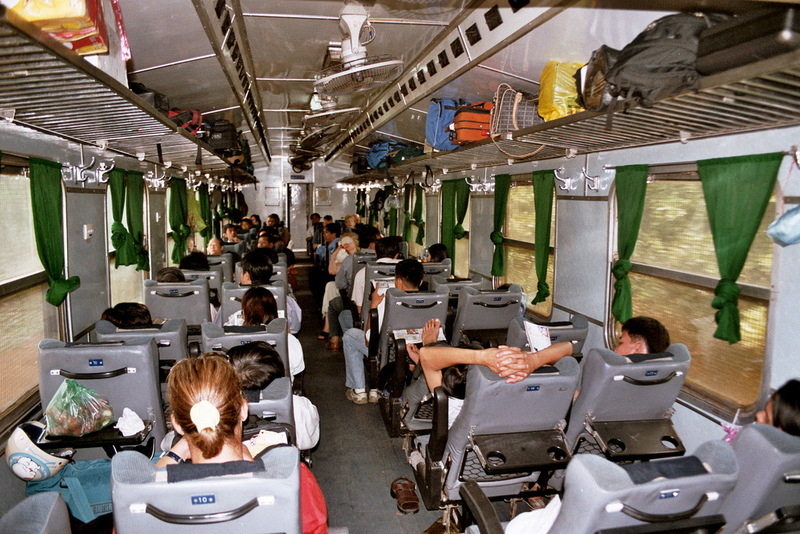 Also, there are various type of train, seat from common to luxury for you to choose to balance your budget. There really isn’t any better way to immerse yourself in the stunning setting of the majestic landscape in Vietnam, while not having to worry about being cut off by a reckless truck driver flying to his destination at breakneck speed. The trains in Vietnam cover almost the whole country, bar the Mekong Delta and Central Highlands, you’re free to walk around the carriages to stretch any stiffness creeping in, there are plenty of options for any budget, from hard seats to soft sleepers, and you’ll have plenty of opportunities to get acquainted to some of the amiable locals en route to your destination. What are the trains like? There are oodles of options when it comes to how you want to travel on trains around Vietnam. Let’s start at the bottom and work our way up. If you’re on a tight budget and it’s not too long a journey you should be able to endure this class on wooden bench seats. For longer trips upgrade, and for overnight, take a sleeper. There is the option of air-con or fan and the fan carriages have the advantage of being able to open the windows, good for budding photographers and ventilation for cigarette smoke. You get what you pay for and as this is the cheapest, don’t get on board with expectations. The next rung on the ladder to luxury is a relatively pleasant improvement. Still not ideal for long haul journeys, but pleasant enough for short trips such as Danang to Hue where the splendid views will take your mind off anything happening inside the train. There are 2 bunk beds in each of these cabins with three beds on each bunk with the cheapest one being the upper berth and the lower berth the most expensive. This is a convenient choice if you’re travelling in a group of 5 or 6, or the Soft Sleeper is fully booked. They are exactly the same layout as the Soft Sleeper, just with an extra bed on each bunk. The most popular choice for foreigners taking a long distance train journey, also the most comfortable and therefore the most expensive. If you’re taller than average take the lower berth as they’re slightly longer than the upper berths. There is ample storage space under the lower berth and above the compartment door. The rooms are pleasant enough for an overnight journey and the price is the same for all bunks. There are a number of private companies who own luxury carriages which are attached to the back of the regular trains. These run from Hanoi to Lao Cai (Sapa), Hanoi to Hue and Danang, and Ho Chi Minh to Nha Trang. They all charge more than the normal soft sleepers run by Vietnamese Railways, but they’re basically the same carriage with similar interiors. So, if you want to discover all the beauty of Vietnam, train will be your best option. With various type and price. Asianadventure team guarantee we will satisfy all of your need. So, what are you waiting for ? Contact us right now. The Asianventure Tours does not necessarily endorse any of the views posted. By submitting your comments, you acknowledge that Asianventure Tours has the right to reproduce, broadcast and publicize those comments or any part thereof in any manner whatsoever. Please note that comments are moderated and published according to our submission guidelines.